This is a delicious and hearty meal for lunch or dinner, your household will appreciate. Cooking beans requires a long heat treatment to grains well seethe and acquired the necessary softness. 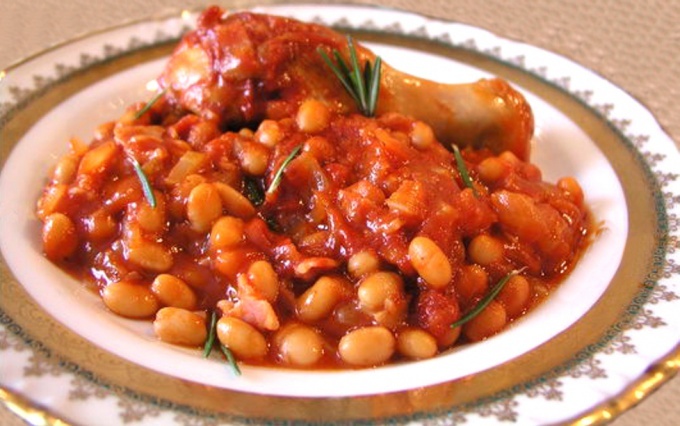 The slow cooker will do the task much easier and faster – beans cooked this way will turn out incredibly tender, the chicken is juicy and flavorful. - fresh herbs of rosemary or dill for decoration. The beans, rinse, cover with cold water and leave to swell for 6-8 hours (best overnight). Before cooking, drain the water, and the swollen beans another good rinse. Onion cut into half rings. Chicken rinse, fillet cut into pieces, a drumstick to use as a whole. Pour into a bowl multivarki olive oil, spread out the chicken and put it on the mode "pastries" 30 minutes. 20 minutes after the start of preparation to fill in the slow cooker the onions and mix well so that the chicken pieces were upside down. To continue cooking. To fill in the slow cooker, prepared beans, add Bay leaf and pepper, pour the specified amount of water, in which pre-stir to dissolve salt, sugar, tomato paste or tomato sauce. Set the mode "stewing" for 2 hours. In the process of cooking the dish several times to mix. Before serving, garnish with rosemary or dill. Cooking time in the mode "stewing" you can zoom in or zoom out to get a lighter or denser beans, depending on preference.